Democracy is a cornerstone in western society. Many major governments operate utilizing the principles of democracy such that their citizens are encouraged to participate in their government and that the voice of the people can be heard. Though it has its flaws, we consider democracy to be superior to any other form of governance, yet organizations often do not operate by these principles. Even organizations that employ thousands of people are usually governed by just a handful who use their resources as they see fit, even if their actions are not in the best interests of the majority. It seems counterintuitive to believe that people collectively should have control over how they are governed in greater society but not in the businesses they spend nearly one third of their life working. The concept of organizational democracy differs entirely from the typical hierarchical power structure by bringing many of the same principles we use in a democratic society into the organization. Organizational democracy is exactly what it sounds like. It is employing the principle of “one person, one vote” into the workplace to ensure a voice is given to all workers. Organizational democracy is not as simple as just giving everyone a chance to vote on certain topics, this is a system that is built into the structure of the organization that guarantees the power of the majority. Specifically, employees in democratic organizations are tasked to participate in all levels of decision making with equal weight, and this is considered part of their responsibilities to the organization. These decisions range from simple proximal things (e.g. employee PTO or the purchasing new equipment for their department) to large scale decisions (e.g. what products/services will the company offer and how the profits are distributed). A few companies exist using this type of model. The most notable example, Mondragon is worker cooperative federation which is made up of 261 companies and co-operatives (including a university) which collectively employ 74,335 people. The company was founded in Spain over 60 years ago and now operates internationally. As a democratic system, members of the co-operative federation participate in decision making collectively by form of a congress in which the members are elected to their positions to represent their respective co-operative members. While some members of the organization may hold a higher elected position, even lower member still get to participate with their vote being equally weighted. The bulk of the research on organizational democracy is theoretical and comes from outside the field of psychology. Research in sociology and economics seems to focus on the larger impact of democratic organizations within society, but research at the organizational level and the individual level seems limited. Research from applied psychology fields have addressed the effects of culture and structure on democracy in the workplace, attitude and motivational differences of employees in democratic organizations versus non-democratic organizations, and even the effects of democracy on a few behaviors like organizational citizenship behaviors. This leaves ample opportunity for continuing research for I-O, especially on the “I” side such as considerations for hiring, performance appraisal, and training just to name a few topics. Plus, given the broader implications of organizational democracy increasing equality and the general welfare of people, this should be a topic to further explore in the HWP realm as well. In summary, organizational democracy would mean bringing our societal form of governing down to the organizational level. Though this seems like an odd and unusual form of running an organization this organizational structuring exists and there is evidence that it is effective. We in the I-O and HWP fields have only begun to explore this topic and much more research still needs to be done! If democracy is the key to participation and equality, then organizational democracy is the next logical step in our society. Little things make a lot of difference. You probably expect that a posting with a title related to punctuation will pontificate on the problem of the Oxford/serial comma, the absence of which recently decided a case with relevance to work psychology (//www.huffingtonpost.com/entry/oxford-comma-court-case-ruling-overtime_us_58cad41ae4b0ec9d29d9dd28). And yet, that’s not what this posting is about, nor is it about any of the fascinating (for some of us, okay?) punctuation-related facts described in Lynne Truss’s Eats, Shoots & Leaves (yes, the title there also plays with the Oxford comma, so I suppose that’s double misdirection). Instead, it’s about a dash. I had an interesting email exchange with former GOHWP Board member Ishbel McWha-Hermann after the recent SIOP conference, in which she mentioned that one of the conversations the Board used to have was about H-WP vs. HW-P. The astute reader will have already noticed that there is no punctuation in GOHWP’s name, nor is there any in HWP as it’s generally abbreviated. The distinction, however, is an interesting one, and points out two perspectives from which people can approach HWP. As Carr, De Guzman, Eltyeb, Furnham, MacLachlan, Marai, and McAuliffe put it in their 2012 chapter, “Humanitarian work psychology incorporates both the application of industrial and organizational psychology to humanitarian issues, and more broadly the development of a psychology that promotes humanitarian work” (p. 4). But do we all think of it from both perspectives simultaneously, and if not, what does the placement of that dash tell each of us about how we view the field? 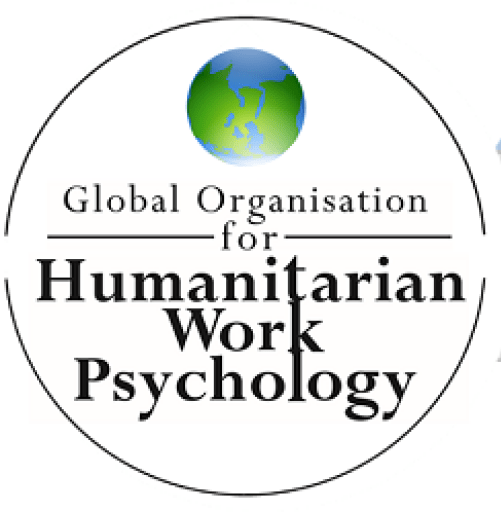 Parsing “HW” from “P” reflects the study of the psychology of humanitarian work. A lot of the work of groups like SIOP’s UN team, the Project GLOW initiative, and Project FAIR (look for more on this in upcoming blogs!) falls into this category. Indeed, in looking at the focus of GOHWP as an organization, this has been what we tend to emphasize. In our Twitter feed, this is largely the kind of work we post about, and the kinds of initiatives we follow. There is a ton (or, I suppose, a tonne) of important work to be done in this domain, particularly as it relates to supporting the UN’s Sustainable Development Goals. That, in a nutshell, is HW-P. The psychology of humanitarian work. H-WP slices things differently, putting work psychology into the service of various humanitarian topics and organizations. This is where things like corporate social responsibility and prosocial I-O tend to fall. A job analysis of volunteers at a soup kitchen, or developing a job skills training program for refugees, would be examples of H-WP. One of my favorite sessions from SIOP 2017 involved a panel talking about doing prosocial I-O, working with various non-profits, religious organizations, and so forth to improve their functioning. Before I had the distinction put to me in fundamental punctuation terms, I’ll admit that it’s something I’d struggled with. It seemed – well, seems – to me that HWP can and should do both things, and that’s what the Carr et al. (2012) definition would suggest. We should be studying humanitarian work, so we can support that sector of the global organizational community, but we should also be taking the skills we develop through our education, training, and work experience to improve all kinds of organizations that contribute to the greater good. HWP, to me, is all about making the world a better place. Wherever you place that dash, you’re trying to achieve the same goal: Help people. Offer our knowledge and skills (ah, heck – and our abilities, to finish the trifecta!) to improve work and thereby make people’s lives better. So next time you think about HWP (and I hope you think about it often! ), ask yourself: Where do I put the dash? Carr, S.C., De Guzman, J.M., Eltyeb, S.M., Furnham, A., MacLachlan, M., Marai, L., & McAuliffe, E. (2012). An introduction to humanitarian work psychology. In S.C. Carr, M. MachLachlan, & A. Furnham (eds. ), Humanitarian Work Psychology (pp. 3-33). New York, NY: Palgrave Macmillan. Truss, L. (2006). Eats, shoots and leaves: The zero tolerance approach to punctuation. New York, NY: Avery.